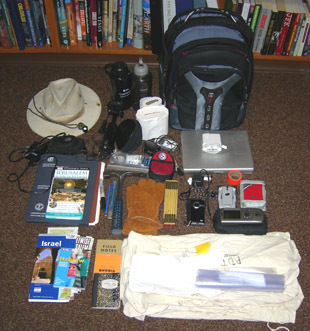 The challenge of preparing for a geological expedition is to be ready for anything and yet also be as mobile as possible. We will be measuring, collecting, mapping, drilling, digging, and photographing, all while making certain the team is well fed, watered and safe. Yet all our equipment has to be packaging in a way that enables us to move quickly through an airport and quickly into a jeep or bus. Fortunately electronic gear has diminished in size and weight (and become way cool) as packs and bags have increased in strength and number of pockets. I leave on Wednesday for fieldwork in northern Israel with my colleague Amihai Sneh from the Geological Survey of Israel. With luck my next post will be from Jerusalem on Thursday or Friday. Meagen Pollock will be leading an expedition to Iceland later this summer; Greg Wiles is going to Alaska; Shelley Judge will be off to Utah. Soon we will all be posting blogs from these various places. Travel is one of the many joys of being a geologist.